Verify the star colour is blue. Verify the star colour is now the brand colour. 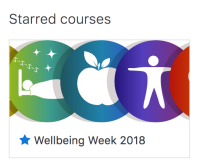 Please test on theme Boost only Login as admin Create a new course Enrol yourself in the new course Navigate to your dashboard Star your course Verify the star colour is blue. Navigate to to Site Administration > Appearance > Boost Change the brand colour to some other colour than blue Navigate back to your dashboard Verify the star colour is now the brand colour. Colors of star on course overview and group messaging are inconsistent. Group messaging is using text-primary while the messaging not.